Why oh why am I doing this to myself? This is wayy too early in the morning to be up but I’ll be out all day tomorrow which means that I’ll miss all the figure skating events. As a result, I don’t think I’ll be covering the competitions in Skate Canada though I may do a post on a few highlights. In any case, I’m pretty sure that if you’re following the GP series that you know that I’m not referring to the Battle of the Carmens at the 1988 Olympics between Katarina Witt and Debi Thomas. This new battle is between two ice dance teams and winning this battle will actually determine the winner of Skate Canada, unlike as previously thought. In any case, the anticipation should be high for the free dance at Skate Canada. Reigning World Champions Tessa Virtue and Scott Moir are in a virtual tie – leading by 0.01 points – with Anna Cappellini and Luca Lanotte. 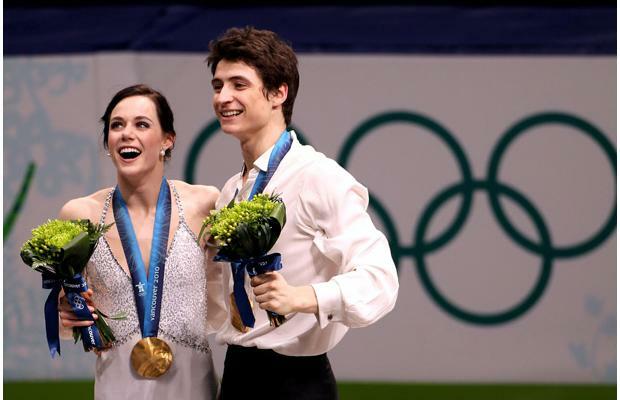 It’s a bit of an unusual situation and it seemed as if there were a lot of downgrades since the lack of distance between these two teams is really down to Tessa and Scott’s low technical elements score (TES). In a normal situation, Tessa and Scott would be leading by 5 to 10 points but unfortunately, they can’t rely on that lead to get them gold here. mais je suis brave! je n’ai pas voulu fuir! This season, Tessa and Scott decided to go for a more contemporary/modern dance interpretation of Carmen. They remark upon a few differences between the usual interpretation of Carmen and their interpretation in this article: “In the end of our story, it’s Carmen who has the power and she has her freedom; and Scott’s character, Don Jose, is just ruined.” Well, you could say that even in death, Carmen is triumphant: she is still free which is what she values most and Don Jose, who according to Carmen’s card predictions will die soon after her, is a man who has lost everything – his mother, his position in the army, the lover who he held so much passion for and most likely, Micaela, a potential wife who truly loved him and a symbol of his peaceful and “pure” past life. So Tessa, just because Carmen dies doesn’t mean she “lost” in any way. What I do like about this interpretation is that it is the closest to what I think is Carmen, the entire character in Bizet’s opera (Prospere Merimee – sorry for the lack of accents – who wrote the original story had created an even more complex character it seems) – not Carmen the seductress or Carmen the gypsy. Carmen and the entirety of spirit. Who do you think will win the Battle of the Carmens at Skate Canada? Ok. I totally should be doing something else right now but I suppose I do need to do these predictions before the competition starts tomorrow as well. I also have a few comments on Tessa and Scott’s Carmen FD but those will have to wait until the weekend. Here is their lesson on goal-setting! Again, this will have to be quick and a bit random because I have so much on my plate right now. So the ladies LP. There were some clean and decent skates involved but the choreography and the execution in some of them left a lot to be desired. Ashley Wagner skated a clean LP. That’s good but it would’ve been better if this program had more in it. Is it just me or are there entire sections where there’s barely any content? And how is it that the choreographer takes some of the best bits of the Bacchanale in Samson and Dalila and NOT take advantage of it? The posing in this case I didn’t mind because they were some of the best moments of the program but seriously, how do you not take advantage of that fast and furious end with the crescendo with a super fast scratch spin? And I may sound mean but that’s because the Bacchanale in Samson et Dalila is one of my favourite pieces of classical music. Ever. Christina Gao also skated cleanly but the entire program reeked of awkward teenager. Girl, you have lovely long limbs. Pretend you are trying to extend them for miles and miles. Also, one movement should flow into the next. The choppiness of some of your movements ruins the effect and flow of the less staccato parts of Libertango. First of all, who the hell gave Adelina Sotnikova “your call is valuable to us, please stay on the line and the next available customer service representative will be pleased to help you” music punctuated by Christina Aguilera singing? I’m really not sure what’s worse, the please hold music or the schizophrenic no-lyrics version of “Burlesque” or the random, non-sensical combination of the two in a program. I think I’d need a few shots of vodka in order for this program to make any sort of sense for me. Meryl and Charlie’s FD this year to Notre Dame de Paris is supposed to be about love and connection. I suppose there’s more that here than in any other program I’ve seen them do but I can’t quite love this program as I loved their 2008/9 OD and FD. Or their Bollywood program. Or their SD this year. I think Meryl and Charlie need a little more time to find that connection to be able to skate as if they’re the only ones there in their own little world. I’m happy they’re trying to address their weaknesses and branch out, which is something I’ve always wanted to see from their Canadian rivals. Ekaterina Bobrova and Dmitri Sloviev are skating a lot smoother than before and Katia seems to have discovered how to use her limbs properly. As for this program, they beat Weave/Poje because they were able to skate it better than they did but I feel as if this program is too “French” for me. I’m not quite sure what’s going on between Dmitri’s roboticness at the beginning and then Katia flopping about at the end. That lift at the end where he’s holding onto her neck? That was not beautiful but just plain scary. I thought ice dance was supposed to look pretty no matter when you take a photo of the skaters. That, my dears, is not pretty at all. Just plain terrifying and creepy. Also, it is just me or does it feel as if Katia might be a little too tall for her partner? Kaitlyn and Andrew didn’t skate as well as they wanted to and so some of their elements were downgraded which is how they fell in the standings and lost the silver. The good news is, they’ve found a pretty decent vehicle to carry them through this season. I didn’t think they would be able to follow up with something as good as “Je Suis Malade” but I admit this FD is creative, artistic and quite pleasant to watch. I look forward to seeing it again. Anyways, I’m off! What did you think of the ladies’ and ice dance competitions? I really don’t have much time to do a writeup of the competition but I’ll lay down some preliminary comments and put out a few highlights. I managed to watch the entire men’s LP but I was out when the pairs, ice dance and ladies’ competitions happened. (Fun day trip full of shopping a good food!) Unfortunately, not all the videos are up but I’ll post more highlights when they pop up on youtube. Very happy for the 3 for 3 pairs predictions. What I’m not so happy about is the fact that Volosozhar & Trankov’s programs this year are… underwhelming to put it kindly. Oh well, at least they landed what I think was a quad throw loop. 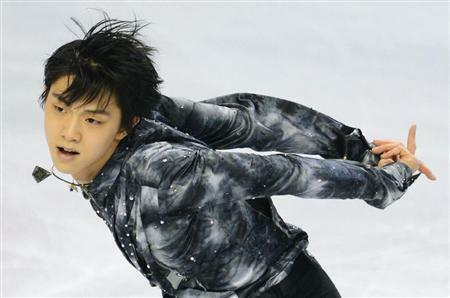 Yuzuru Hanyu broke a world record in the SP! I just wish he could’ve done well enough in the LP to win it. So, every time PJ Kwong from CBC and I have the same gold medal predictions, something really weird happens to screw up our predictions completely. Although the competition isn’t over yet, I think that weird thing has already happened. Yuzuru’s messy LP screwed up our gold medal predictions for him while the totally unexpected event? A Japanese men’s sweep of the podium. I think we were both expecting to see Jeremy Abbott in the mix (though his Twitter indicates that he has a bit of a spine injury right now and while he was skating the LP) and we definitely didn’t expect to Tatsuki Machida to do pretty decently. Speaking of Tatsuki Machida, please someone tell me that I wasn’t the only one who laughed 5 minutes straight after that “wing flapping” bit of his program at the end of his LP. I couldn’t stop giggling for the longest time. That was hysterical. Meryl and Charlie’s SD was lovely. I love the music from Giselle and the light and airy choreography that they’re wonderful at. They’ve improved their unison and I’m so impressed. I also love the fact that there are so many random music cuts. Adelina Sotnikova – pity she singled her second jump but she’s a lot more watchable this season. I got a bit bored watching her midway through her programs last season and she’s finally gained some – note, some – of Liza’s *star quality*. Also, darling girl, you’re supposed to be intense with your arms during your step sequence but your arms are not planks of wood, so stop moving them like they are. Ashely Wagner’s SP isn’t that bad but I’m impressed by her steadfastness on the ice. She kind of reminds me of Joannie Rochette. I’m not sure how I feel about that. What did you think of Day 1 & 2 of the Skater America competition? I’m working on Skate America predictions, I swear but I figured it would be fun to make predictions for the World Champion at the beginning of the season and see how close or how far my predictions are many months down the road. I won’t make any silver or bronze predictions just because I’m so short on time (so many chores and other things to do!) and I need to write the Skate America predictions before the competition starts on Friday.